The Moon, just like before, excites the human imagination as it hides many mysteries that we are seeking to solve. 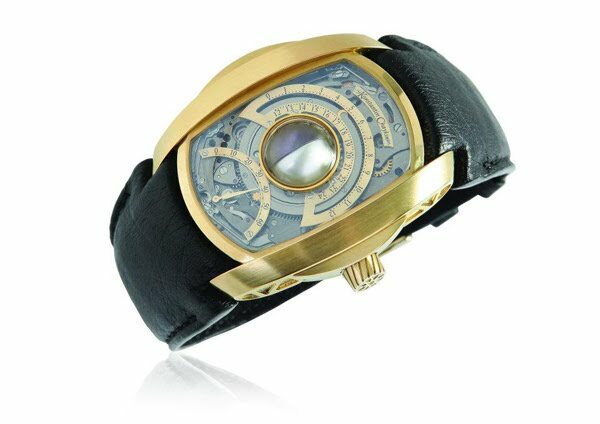 In March 2011, the world-famous watchmaker Konstantin Chaykin introduced an innovative invention embodied in the exclusive Lunokhod watch. Through this watch, he offered his vision of such complication as a moon phase indicator. This was an absolute and unconditional triumph of engineering thought. The horology world was captivated by skill and ingenuity of Konstantin Chaykin. And today, the sky was lit up by a New Moon. The master presents an updated version of the famous Lunokhod watch. The heart of this unique watch is still a small copy of the Moon, the most mysterious celestial body. But if in the first version the Moon was represented by a ball made of wootz, it is now replaced with a large saltwater pearl. It is no coincidence that the master chose this stone of organic origin. Due to their shape and unique qualities, pearls have always stood out among the many gems. Enigmatic and mysterious, they were first used to create jewelry many centuries ago. Sometimes pearls are called the "Moonlight." It is as if nature itself created them to represent the Moon. Special thing about pearls is that they are naturally round-shaped (or pear-shaped) and do not require any special additional processing. But finding a perfectly round, natural pearl is very difficult. In search of excellence Konstantin Chaykin had examined hundreds of beautiful contenders for the role of the Moon. 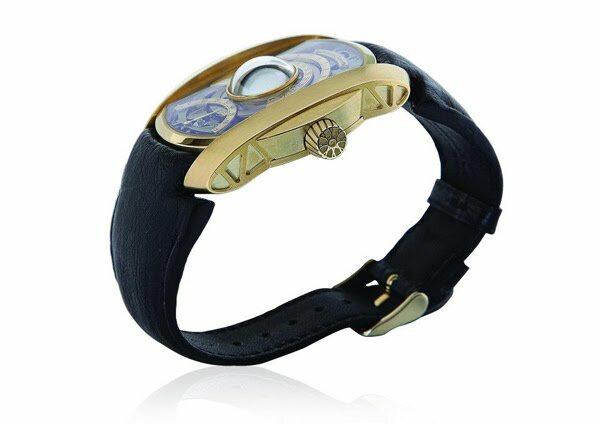 This was not an easy task as in order to become part of a watch, a pearl must be not only beautiful, but also absolutely flat, which is very rare in nature. The master was fortunate enough to have found the one that now represents the Moon in his new watch. The pearl, too, got "lucky": Along with its most famous "relatives," it received its own name - the Watch Moon. There are 7 more pearls to be found as new model will be limited to eight samples. The calibre of the new Lunokhod watch was completely designed and developed by Konstantin Chaykin Watch & Clock Atelier. Each part of the watch has been ground and polished by hand. It is the only mechanism in the world that uses a raw natural material as a functional element of the design! Nonstandard technical design of the mechanism is also determined by the need to set a spherical moon-phase indicator in motion. The ideally round pearl, 12 mm in diameter, is always fixed as the Moon itself relative to the Earth, and the change of phases is displayed by a silver half-sphere rotating around it, symbolizing the shaded part of the Earth satellite. Moon phases replace each other continuously, with equal intervals. Revolution period is 29 days, 15 hours, 44 minutes and 2.8 seconds. The unique calibre is equipped with a patented, Moon phase continuous correction device. Konstantin Chaykin was the first one in the world to introduce this innovative solution in a mechanical watch. New Lunokhods have undergone a number of other improvements. Now, minutes are indicated by a retrograde scale located at the bottom of the dial. Hours are still displayed in the 12 and 24 hour format. Clock dial is a transparent sapphire glass revealing the "mechanical lace" made of hundreds of continuously interacting components. This exclusive mechanism deserved a decent frame. Its case was made of 18-karat gold. This precious metal has long been considered the most luxurious. Anything made of gold has a special chic and sophisticated aristocracy. Would you like to see the back side of the Moon? Simply turn over the clock, and through the transparent back cover you will be able to observe the complex and amazingly interesting life of the components setting the exact mechanism in motion.